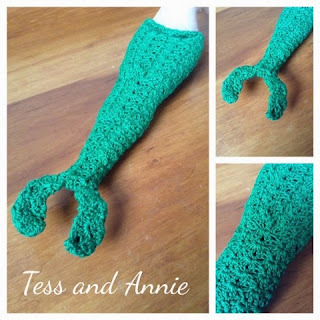 Here is the pattern for the Barbie mermaid tail. It took a while to get this post ready, but here it is! Note; Shell = (dc, dc, ch 2, dc, dc) in st indicated. Row 1: Ch 41, sc in 2nd st from hook (skip next st, shell in next st, skip next st, sc in next st) across, turn. Rows 2-4: Ch 1, (sc in ch2 space of shell, shell in next sc) across, turn. Rnds 5-12: Ch 1, (sc in ch2 space of shell, shell in next sc) across, join to 1st st, turn. Rnds 13-17: Ch 1, (sc in ch2 space of shell, shell in next sc) 2 times, sc in next shell, v-st in next sc, (sc in ch2 space of shell, shell in next sc) 2 times, sc in next shell, v-st in next sc, (sc in ch2 space of shell, shell in next sc) repeat only the last sequence to end, join, turn. Rnd 18: Ch 1, (sc in ch2 space of shell, shell in next sc) 2 times, (sc in ch2 space of shell, dc in next sc) once (sc in ch2 space of shell, shell in next sc) to end, join, turn. Rnd 19: Ch 1, (sc in ch2 space of shell, shell in next sc) 2 times, sc dec over next sc, shell and sc, (sc in ch2 space of shell, shell in next sc) to end, join, turn. Rnds 20-29: Repeat rnd 5. Rnd 30: Repeat rnd 19. Rnds 31-37: Repeat rnd 5. Rnd 38: Ch 1, (sc in ch2 space of shell, shell in next sc) sc dec over next sc, shell, and sc, (sc in ch2 space of shell, shell in next sc) join, turn. Rnds 39-44: Repeat rnd 20. Fasten off at end of last rnd and sew the opening at the end of rnd 44 closed. Weave in all ends. Row 1: Ch 5, sc in 2nd ch from hook, skip 1 st, shell in next st, skip last st, turn. Row 2: Ch 1, sc in ch2 space, shell in sc dec, sc in 1st dc of next shell, shell in next sc, turn. Row 3: Ch 1, (sc in the dc of next shell, skip ch2 space, shell in next dc, sc in next dc, shell in next sc) across, turn. Rows 4-5: Ch 1, sc dec over 1st shell, sc in ch2 space of next shell, shell in next sc, sc in ch2 space of shell, sc dec over shell, sc in ch2 space of shell. Fasten off. Flipper will naturally fold in half. Sew sides together and sew onto the tail. I love the look and the idea of this tail, but I am stumped. I had 10 shells at the end of row 1, but each row after that was one shell less. When I got to row 5 I had 6 shells, and I'm not sure what st you are referring to when you say "join to the 1st st. Does that mean we will be crocheting in the round from this point on? If so, how do you "turn" at the end of each row? Can you help me? I'd really like to make this for my granddaughter . At row 5 you join to the 1st st of the row and from then on, you will be crotcheting in rounds instead of rows. To turn at the end of the row, just turn the piece and start with the next row. I hope that helps! It's hard to explain how to turn a row. I've never had to "turn" at the end of a row when crocheting in rounds, but I'll play with the pattern some more. Thank you for responding so quickly to my question. You really came up with a beautiful look for the tail. Have you considered making a You Tube video of this pattern? If I ever get it figured out, I'll send you a picture of the finished tail! No problem! Thank you so much for visiting my blog! I hope that the pattern works out for you. I can't wait to see how it turns out! I may make YouTube videos in the future. I'm still thinking about it. Thank you for the suggestion!